Dichondra Repens, also known as Kidney Weed, (Dichondra repens) is an Australian native plant that is an attractive and useful ground cover or lawn substitute that will grow readily in most climates. A vigorous grower if watered regularly, Dichondra provides a dense ground hugging cover, and whilst the preferred aspect is full sun it grows readily in areas up to to 80% shade. Attractive between pavers and as it is completely maintenance free, is very useful for steep banks and other inaccessible positions. Can tolerate light foot traffic so is a very good lawn substitute, particularly in shaded areas. Plant 25-30cm apart or closer for faster cover. 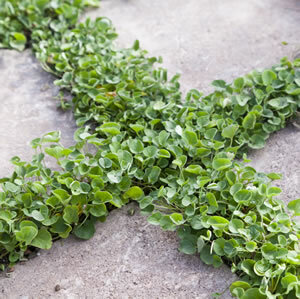 General Information: Very useful substitute for lawn, Dichondra will spread to provide a green mat in many climates. 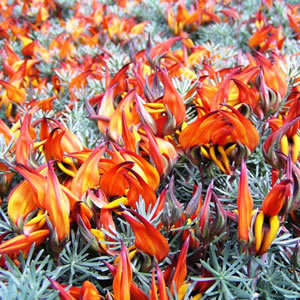 A ground cover plant will grow wider than it grows higher, and is a very useful addition for landscaping and ‘infill’ amongst garden beds. 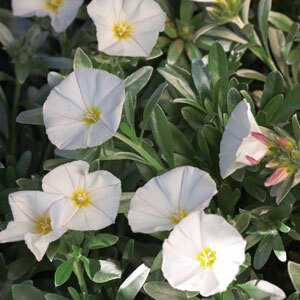 Dense groundcover plants will smother and shade-out weeds quite effectively. Planting: Plant in a hole at least twice the size of the pot, plant in soil the same level as in the pot. Tips: If used as lawn plant will not tolerate a great deal of traffic but will grow back quite quickly.